There are safety limits for radiation emission from cell phones. In cell phones used in real life and stored mostly in pockets, these safety limits would be difficult to meet. So, when the standard laboratory tests were developed for measuring radiation emissions from cell phones to assess their compliance with safety limits, a “loophole” was “somehow” introduced to the laboratory tests permitting measurements at a distance from the surface of the test dummy (= at a distance from the users body). The difference between Volkswagen software and cell phone testing loophole is that the software was illegal whereas the “loophole” is legal. This “loophole” distance varies, not only between different manufacturers but also between different cell phone models from the same manufacturer. Some phones meet safety limits already at 1cm away from the body but others need to be 2.5cm away from the body to meet safety limits. This distance of 1 – 2.5cm in laboratory tests permits that all phones are able to meet safety limits. But, at least some of these cell phones, do not meet safety limits in real use conditions, when users keep them in pocket and, for smart phones, these are simultaneously connected to internet and carry on data traffic. How many of the cell phone models would not meet the safety limits when measured at distances well smaller than the 1cm, mimicking phone kept in the pocket, nobody knows, because tests done by manufacturers are always performed and reported for the radiation emissions at a distance of 1 – 2.5cm away from the body. This means that many of us, cell phone users, keep in pockets phones that do not comply with the current safety limits. Manufacturers seem to be aware of the problem caused by keeping the phone too close to the user’s body. They warn that keeping cell phone closer to the body than the distance specified in cell phone booklet may cause that radiation absorbed by the body is not in compliance with the current safety guidelines. But there is more… as seen from the example below, some manufacturers say they did not test radiation emission/absorption at distances closer to the body than the 1 – 2.5cm mentioned in booklets. Question is why such measurements were not done or, rather, why they are not made available publicly? It is difficult to believe that such measurements were not done by the manufacturers… The LG does not say that the measurements were technically not possible. They simply say the measurements were not done. Finnish company CELLRAID commissioned from a specialized testing laboratory, measurements of SAR of cell phones at a distance from 0 to 5cm from the test dummy (= user’s body). The measurements were performed in state of the art SAR laboratory using certified and publicly known and widely used measurement equipment (DASY4). The same lab routinely performs compliance tests of cell phones for telecom clients. The lab is a former NOKIA lab in Oulu, Finland, that tested NOKIA phones for compliance with safety limits (http://www.grant4com.fi/service_1.html). Measurements obtained by CELLRAID indicate that some cell phones when kept in pockets do not comply with the current safety limits. Table and graphs below show a few examples of SAR values for two Samsung and one Sony phones. SAR is shown for conditions when the averaging is over the 1gram of tissue, as per safety guidelines of the IEEE in USA. What is not shown in the table, but what was shown to me, is that when averaging is done over the 10g of tissue, the SAR at distance of 0cm is still above the permitted safety limit; SAR was 3.04 (averaging over 10g) and 6.00 (averaging over 1g). This means, to me, that every time the user puts cell phone in a pocket, this cell phone emissions absorbed by the body might NOT COMPLY with the tested and approved safety standard. The testing protocol does not mimic the real life conditions. There are up to 7 billion users of cell phones worldwide. How many of the users, by keeping phones in pockets, are exposed to radiation levels that are not in compliance with the safety limits? We do not know. According to the cell phone manufacturers, the network operators and the safety standards setting agencies, all phones are safe for unlimited use by anyone, irrespective of their age or health status. This, however, might be yet another claim that misleads users. Epidemiological case-control studies (INTERPHONE, Hardell group, CERENAT) have indicated, though did not prove, that persons using cell phone for 30 minutes per day for 10 years period have an increased risk of developing brain cancer – glioma. Participants of these studies used cell phones they purchased in shops. Phones that were certified by the laboratory tests to be safe for unlimited use by anyone. Yet, avid use of these safe phones led to an increased risk of developing brain cancer. This means that the current safety limits are insufficient to protect health of the users. What is more, many users keep phones in pockets and irradiate other than head parts of the body too, and to radiation levels that are not in compliance with the current safety limits. We do not know at all what will be the consequences of the prolonged exposures of various parts of the human body to radiation levels that do not comply with the current safety limits. Telecom should be required to produce results of radiation compliance tests performed in real-life conditions, when the phone is very close (e.g. 0.1 cm) to users body. Did CELLRAID do ‘volkswagen’ to the telecom industry by showing lack of compliance with safety limits? This entry was posted in Mobile phones and health and tagged Apple, Blackberry Pearl, case-control, cell phone, cell phone radiation, Cellraid, CERENAT, cheating, compliance, EPA, epidemiology, FCC, Finland, Hardell, IEEE, Interphone, iPhone, LG, LG Nexus 5, LG Shine, LG VX8350, Microsoft, Motorola, Motorola E815, Oulu, pocket, safety limits, safety standards, Samsung, Samsung SGH-a737, SAR, Sony, telecom, US EPA, Volkswagen by dariuszleszczynski. Bookmark the permalink. Thanks Tom. Wiko knows…and that is good. France is front runner. However, our application Quanta Guard helps to prevent the high RF Exposure automatically. Tom: Nice article and good information. Thanks. Still, my message is as originally tried to express; current “radiation limits” of cell phones are clearly passed, when the phones are used in a normal way. Existing regulatory for RF exposure testing is out of date. We are not in 1996 world of telecommunications anymore. I believe you agree on this? Tom: Your conclusion could be understood in a way, that there is not need to have SAR & RF emission regulation at all? And it is also needless to inform the consumers that “phone should be kept with certain distance from the body”? In that case I believe the right target for your findings and opinions should be the regulatory bodies and phone manufacturers. Until there is regulation and until the phone manufactures “warn” the consumers, we are very open to co-operate with regulatory bodies, phone manufactures and consumers, using our technology. Pasi – There is no reason to be concerned with the measurement and reduction of SAR values other than for the reduction of biological and health affects attributed to this metric. It is meaningless in any other context. There is no possible way for anyone to measure the SAR value directly while devices are in use. Only power density measurement is possible using personal dosimetry – but this must be done with a separation of less than 20cm (in the near field). Accurate measurements of power flux density cannot be made under such conditions. Therefore, only inaccurate reference value measurements can be taken in uncontrolled conditions and approximated into SAR. The measurement uncertainly from estimating and translating surrogates in such a process cannot be offset by any amount of data manipulation. Nobody can make unreliable data produce reliable results – or turn lead into gold. In other words; garbage in = garbage out. This is my final comment on this topic. Tom – we, I, and Cellraid are not talking about health effects. That is doctor’s job. We are engineers, and talk about SAR & Power Density values, and have developed technology to measure, monitor and reduce RF Exposure. For that reason, we have made laboratory measurements and noted that SAR values are clearly going over the limits (US 1.6w/kg, Europe 2.0w/kg), when the phone is close to human skin (0-10mm), and when coverage is poor, network congested, or network poorly optimized. Our algorithm calculates the values in real-time situation too, and have been tested with several networks in several countries. Some operators have networks in a good shape, and then high SAR/power density values are not happening as often as with poor quality networks. Our system (Quanta Monitor) can monitor the real time usage, and when the limits are passed (say US limit 1.6w/kg), Quanta Guard acts and cuts the peak of high RF exposure off, and end user is protected and using his phone according to regulation. Everyone happy: the user, regulator, operator, phone manufacturer, doctors….multiple way win situation. Right? Please try yourself in your country (US? ), with several different networks, and you will be surprised how different the results are between different operators. BTW – about the Interphone study – what was the distance of the phone from the user’s body? Quick look for it – at least the funding portion seems to be interesting (neutral?) And it seems to be concentrated on voice call (head) and minutes – which have little to do with today’s data oriented world, when the phone is on the skin, and minutes do not matter much. Pasi – SAR is not a measurement of cellphone emissions; it’s a little bit more complicated than that. Here are some items which more fully explain why I do not share your beliefs and concerns about the potential adverse health effects of RF exposures from cellphones as typically used in real life. During the INTERPHONE study 1,233 maximum SAR values averaged over a 10 g cube of tissue were registered (Cardis et al., 2011). They ranged from 0.01 W/kg, which is actually the sensitivity limit for measurement equipment, to 1.7 W/kg. The vast majority of values, however, were below 1 W/kg. Although not statistically significant, a trend of decreasing SAR over a period of years was clear from this study. This trend was confirmed by Kühn et al. (2013). Tom – Yes we do understand (and take into account) the uplink power control and used resource allocation in our algorithm. And we completely understand that due to these functionalities the SAR emitted from phone is not nearly all the time the maximum SAR. However at the same time SAR can be and many times is more than suggested by the phone manufacturers. And this is because the phone is held closer to body than it is certified by SAR measurements. What comes to your statement that SAR is below maximum SAR when measured without spacer; please share measurement data for this. We got exactly opposite results when we tested top5 selling phones. Pasi – The reality is that your own data can be extrapolated to real-life exposures by using logic, commonsense, and some simple arithmetic. Your measurements indicate a maximum 10g SAR of 8W/kg – at 100% duty cycle, and no separation. Accounting for the real-life time division reduction of 87.5%, the maximum SAR using an actual cellphone would be 1W/kg. This would be further reduced during typical operating conditions by the real-life engineered features of APC and DTX – by up to 3 orders of magnitude, or more. This is why the possibility of non-compliance with SAR limits should not be viewed with any greater concern than compliant use. A cellphone against the body without a spacer will generally result in actual SAR below the maximum SAR tested. For the FCC limit, the math is slightly different – but the conclusion is the same. Tom; FCC & industry is very welcome to communicate with us, as they know about our existence and solutions. Naturally FCC, Arpansa, Ofcom, Trai, ITU… and all regulators, as neutral organization, ensuring consumers protection & quality of service should have more interest for new technical development. Difficult to believe that when industry has grown from 70m to 5B users in 20 years, data from 0% to 90+%, smart phones from 0 to 60+% , children usage from 0% to about 100%….. we still have the same regulation…thinking that the phone is on the ear 15mm distance from the skull, and communication is seen as occasional once in a week voice call from grand-mom….when the reality is that youngsters are participating in dozens of whats up groups, receiving data 24/7, and keeping phone as their pillow. Pasi – Please submit your lab notes and measurements to the FCC in order to clear up their misunderstanding of this issue. Reference their Docket # 13-84. I’m sure they will be very grateful, and quite impressed by your proof. Be sure to include details on how your product enables a body-worn cellphone to provide accurate SAR measurements. to Tom – In theory user can control the data usage. In practice however people do not do this as updates for emails, facebook, twitter, calendar and other critical operating system software updates etc would be affected. So while you are right that user has control they do not tend to do that. This is just against to human behavior. This is exactly why we have made our Quanta app. So that user can see how much they are getting exposure and at what levels. This might motivate them to use Quanta Guard – to be protected of high exposure levels. I hope you tried Quanta Monitor and Quanta Guard already? 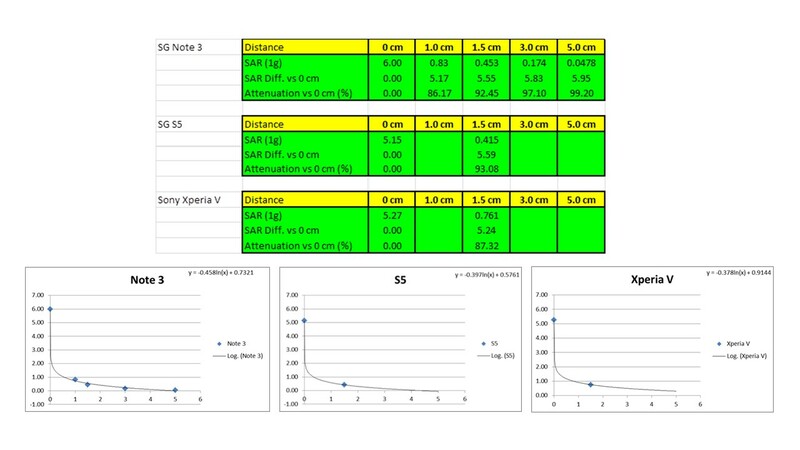 to Tom: We have measured in SAR lab using industry standard tools clear excursions 4 to 1.5 times of 2W/kg@10g SAR readings when phone is placed against phantom (not with 15mm separation as manufacturer has tested them). We have lab notes and measurement reports to prove that. So it is a fact that the limits will be exceeded in real life use scenario. The measurements we have done, could be repeated together in co-operation with telecom authorities, operators, mobile phone manufacturers, investigators…so we can go closer to practice and take some distance from theoretical debate. I don’t make any such claim. But, that is pretty much what the FCC says, and I don’t know why I should doubt their conclusion. See paragraph 251 of FCC 13-39 previously posted below. BTW- For the less stringent 2W/kg@10g SAR, there is even less reason for concern. To Pasi – Basic cellphones and Smartphones in standby mode only need to send brief and infrequent updates that have little effect on transmit time. But, several Apps which may be installed on your Smartphone have the potential to significantly affect transmit time – and battery life. However, as this is not an inherent property of the device, the phone user has full control over any impact it may have on the user experience. Check out the attached link for some tips on how to do this. The telecom industry is very aware that they are deceptively hiding the consumer disclosure to never use a phone closer than the min sep distance (as in a pocket or tucked into a waistband or bra as MANY people do when connected on a call using BlueTooth, etc). When the City of Berkeley, CA adopted an ordinance that makes available this information to consumers at the point of sale – the CTIA Wireless Assoc sued the City, claiming that requiring retailers to say something to their customers that may be seen as controversial is against the 1st Amendment of the US Constitution. The required wording is almost verbatim to what manufacturers’ are burying in legalese fine print on phones where no one will find it, written in language a consumer can understand. And, they are suing to make sure they don’t have to disclose this to their unsuspecting customers. The REAL problem is that no one really knows if a 50-fold factor IS adequate given that so many studies now show non-thermal effects at levels hundreds and thousands of times below the current standard. 1. The mobile phone is positioned against the phantom body and switched on to full power. 2. The precision robot moves the RF probe throughout the phantom body measuring the radio signal level in the body near the phone. 3. The computer analysing the data converts the radio signal levels into SAR (W/kg). 4. The maximum level measured is recorded as the SAR value against the body. It is NOT accurate to state that cell phones are tested directly against the phantom. This implies that SOME phones may require a min separation – this is misleading as ALL phones are currently tested held away from the phantom and therefore require that distance to be held away from the torso to fall within safety guidelines. Apple has tried to test using zero separation so they would not have to put information out to their customers that might imply that using a cell phone in their pocket, or tucked into a bar, is not safe…..however, Apple iPhone was not able to meet the SAR requirement for use directly on the body…..therefore, the newest iPhones still deceptively hide the consumer disclosure that the user must maintain a 5 mm distance if worn or used directly against the body as in a pocket, etc. The information on the website you reference also says, “Check the phone handbook or user manual – look under safety or specifications”…. Have YOU tried to find the FCC-required consumer disclosure on min sep distance on YOUR phone? There is typically no “handbook or user manual” provided with a new phone. The consumer disclosure is now located buried deeply within menus, typically under “legal” categories. Go try to find it….. and please report back the steps you went through. Tatro, BTS exposure levels are normally 1000-1.000.000 times lover than phone itself is causing. Good evening. Interesting conversation, and good to have talks about this important topic. Pasi: Talking is 5% of mobile communication is modern world (like in Finland). The rest is data. Phone is communicating to the base station and wifi even it is on the bra or pocket, and the user is receiving whatsups, twitters, news, emails 24/7. Phone needs to transmit to notify the base station “package received”. Otherwise there is no functioning data service. Pasi: Do you claim that in the US for instance the level of 1.6w/kg is never passed? Not even <1.0cm distance from the body? For another viewpoint, you may be interested in a couple of paragraphs in an FCC Report & Order, dated March 29, 2013. A link to the full document follows below. set at a level on the order of 50 times below the level at which adverse biological effects have been observed in laboratory animals as a result of tissue heating resulting from RF exposure. This “safety” factor can well accommodate a variety of variables such as different physical characteristics and individual sensitivities – and even the potential for exposures to occur in excess of our limits without posing a health hazard to humans. significantly greater concern than compliant use. Phone in pocket DOES NOT COMPLY with the current safety limits as per info in cell phone booklets provided by the manufacturers. No matter what is done in test labs where unrealistic scenarios are used for measuring compliance. In real life cell phone is in pocket and it does not comply. End of story. This cellraid app shows very low cumulatuve exposure compared to base stations exposure, which are on all the time. Perhaps I did not express myself correctly regarding my level of agreement. It is only ‘possible’ that some untested positions ‘may’ be out of compliance. Always using the correct accessories will eliminate this possibility entirely. And, any system update transmissions while not talking are extremely brief and infrequent. In short – this is an arcane issue of compliance, not safety – there is no smoking gun here! Your statement about margins in safety limits, even though correct is irrelevant – phone should be in every day use in compliance with safety limits. If it is not it is incorrect situation. Finally, since keeping separation between body and phone is important, as clearly stated in cell phone accompanying booklets, I wonder why this info is not displayed prominently and at the beginning of the booklet but “hidden” and difficult to find? Why? The answer to your question, and to many other questions will be found there, particularly at the FCC site. I do certainly agree with your contention that SAR compliance testing does not mimic real life conditions. If a separation distance is specified and not adopted then the phone is possibly being used in a non-compliant position. However, this is not a certain outcome. Do be mindful of the fact that SAR compliance testing includes several positions – including full contact with the head. Tested positions do not include inside a bra or pants pocket. But, it is not common to talk on the phone when it is in those locations – and when you’re not talking, it’s not transmitting. Please compare the power attenuation of time division multiplexing (87.5%) to the attenuation of 1cm for the Note 3 or 1.5cm for the Sony Experia. Or, add DTX to the TDM (93.75%) and compare it to the attenuation of 1.5cm for the S5. Clearly, the exposure reduction due to engineering features of the device is comparable to that of separation distance. Furthermore, much or all of the required separation from the back of the phone can be provided by the phone itself when the phone faces the body. Or, the manufacturers’ body-worn accessory can be used to ensure full compliance in any situation. Tom, if everything is as you say, why manufacturers in the booklets say the users must not place phone closer to their bodies than the 1 – 2.5cm? Due to these features, actual phone output can fluctuate between a peak of 2 Watts down to an average of 62.5 microwatts – rising and falling randomly due to unpredictable usage patterns which are impossible to accurately quantify – a dynamic range of 45 decibels; which means the output varies by a factor of 32,000 times from highest to lowest. There are a couple of important conclusions that flow from this discussion. Firstly, since SAR compliance testing is performed at 100% duty cycle for multiple device transmitters (Wi-Fi, Bluetooth, etc.) simultaneously and at full peak power – real life exposures from cellphones will always be much lower than the regulated maximum. This ensures that current compliance standards are extremely conservative. Secondly, since the fluctuating power output is random in nature, it cannot be correlated with proxy exposure metrics – like number of calls, length of calls and cumulative call time. These are used as dose surrogates in epidemiological studies of potential health effects due to cellphone exposure. This is a severe limitation of such studies – as reliable results cannot be obtained from inherently unreliable data. It’s analogous to reaching conclusions on the nutritional value of someone’s diet by studying the frequency and total amount of time they spend eating – but completely ignoring what they eat, and how much they eat. The blog post stated that “Epidemiological case-control studies (INTERPHONE, Hardell group, CERENAT) have indicated, though did not prove, that persons using cell phone for 30 minutes per day for 10 years period have an increased risk of developing brain cancer – glioma.” However, Hardell’s pooled case-control study “concluded that glioma and also acoustic neuroma are caused by RF-EMF emissions from wireless phones, and thus regarded as carcinogenic, under Group 1 according to the IARC classification” (http://www.pathophysiologyjournal.com/article/S0928-4680%2814%2900064-9/pdf ). It appears that Dr. Leszczynski disagrees with Hardell and Carlberg’s conclusion? If so, what part of their argument or their application of the Hill Criteria for causality is in dispute? So there you have it. ICNIRP guidelines are useless by their own definition. Lawyers should have a field day. I wonder how many telecoms putting up base-stations or schools installing WI-FI equipment have ever surveyed the coverage area for children, elderly or chronically ill?